Exercise is now recognised as a major preventive risk factor for the majority of diseases and requires aggressive promotion by health authorities.1 However, exercise prescription is not as straightforward as it might appear, as sudden increases in physical activity and sport are associated with injuries, particularly tendon injuries.2–5 The current surveillance and understanding of the causes of gradual onset (sometimes termed ‘overuse’) injuries associated with sport and exercise are poor,6 ,7 making it difficult to recommend ideal amounts of exercise. It is particularly difficult to prospectively assess loading risk factors for tendon injuries, as keeping detailed long-term records of tendon loading is particularly arduous and expensive. Understanding risk factors for gradual onset tendon injuries may be more easily improved by following elite athletes8 for whom detailed loading records are often kept. However, the difficulty with assessing elite athletes is that the majority are subjected to a high, but fairly constant workload, increasing the challenge of assessing the effects of workload changes on injury risk. Of the major global team sports, cricket has both a high rate of gradual onset injuries and great variations in player workload.9 Whereas most team sports are played over a short and fixed duration, cricket is played in a variety of forms. Balls in cricket are delivered in groups of six, called ‘overs’. Therefore, 20 overs in cricket consist of 120 balls. One-innings matches are played with a maximum number of set overs (usually 20 or 50 overs at international level) to be bowled in each team's (single) innings, with each bowler being allowed to bowl a maximum number of overs (usually 20% of a team's total overs). Limited overs matches with 20 overs per team are often referred to as ‘T20’ matches. First class cricket matches (including international Test matches) are played with unlimited overs lasting 4 or 5 days (with two innings per team). The length of an innings in first class cricket is not fixed, which leads to great variation in workloads. In these matches, bowlers can sometimes be required to bowl in excess of 50 overs (300 balls) over the 4–5 days. In addition, the international cricket calendar is fairly unstructured, with no fixed number of matches of the various varieties for the major national teams. Cricket is also the only major team sport where substitute players are not permitted for most facets of the game (fielding substitutes are permitted, but bowling substitutes are not). When a team loses a bowler to injury, other bowlers tend to increase their workloads to make up for the missing player.10 These factors make cricket an ideal sport to study for the development of gradual onset injuries. Broadly speaking, there are two major bowling types in cricket: fast bowling (also known as pace bowling) and spin bowling. For the purpose of this paper, the term ‘fast bowlers’ refers to bowlers who bowl fast, medium-fast or medium (ie, bowling with a fast run-up, with ball speed generally above 100 kph and where the wicketkeeper will generally stand back from the stumps), as opposed to spin bowlers to whom the wicketkeeper would normally stand up to the stumps. Fluctuations of game type, innings length and the variable schedule impacts fast bowlers more than others. Fast bowlers are the most prone to injury,11 ,12 which is generally of a gradual onset nature. The fast bowling motion involves a run-up and straight-arm hurling (not throwing) movement with the predominant associated injuries occurring to the lumbar spine13 and lower limb.12 ,14 For clarity, it is noted that the term ‘workload’ in this paper refers to match bowling load. When comparing cricket to baseball workloads,15 there appears to be a slightly greater tolerance to bowling loads in cricket than pitching loads in baseball. Although 20 overs (120 balls) in a day is still a very high workload in cricket, a fast bowler would still be able (and be expected) to bowl again the following day if necessary, whereas a baseball pitcher who had pitched 120 times would usually have a minimum of 3 days rest before being able to competitively pitch again. The objective of this study was to examine workloads in fast bowlers during and prior to cricket matches and to investigate relationships between workload and injury risk for different tissue subtypes (bone, muscle, tendon and joint). Cricket Australia conducts an annual injury survey of contracted first class players. Methods for this survey have been described previously.11 The methods used for Cricket Australia injury surveillance are non-interventional, conform to the Code of Ethics of the World Medical Association (Declaration of Helsinki), and have been approved by the Cricket Australia Sports Science Sports Medicine Advisory Group. This was a prospective cohort study investigating relationships between injury risk and workload status in fast bowlers. The analysis was performed for fast bowlers over 15 seasons, 1998–1999 to 2012–2013 inclusive. De-identified bowling injury data (injuries sustained while bowling) were extracted from the pre-existing database. Workload data were extracted from the official scorecards in first class and List A matches (1-day and T20 matches), and relate to match workloads from this level of games only. Training workload and match workload from lower level matches (eg, club games) or overseas games not involving Australian teams were not available. In 2005, cricket researchers published consensus international injury definitions for the sport and the methods of this survey adhere to the international definitions.20 ,21 The definition of a cricket injury (to a bowler) is one that either: (1) prevents a player from being fully available for selection in a major match (which is a List A or first class match), or (2) during a major match, causes a player to be unable to bat or bowl when required by either the rules or the team's captain. This study concerns fast bowling injuries only and therefore, includes a data set of injuries in fast bowlers sustained either with an acute non-contact bowling mechanism or a gradual onset bowling mechanism. Injuries in bowlers which were sustained either when batting or fielding (including being struck by a batted ball when bowling) were not included as part of this study. Although workload data were not available for training sessions and lower level matches, injuries that occurred in these settings which prevented participation in matches were included. Injuries were coded using the OSICS V.9 system.22 The second character of the injury diagnosis was used to subcategorise bowling injuries into muscle, bone stress, tendon or joint injuries. Risk factors considered were: bowling load in the reference match and match workloads (for all major cricket competitions involving Australian teams) in the previous 3 months, previous season (season prior to current one) and career. The workloads were converted to binary status at various round number cut-off points to attempt entry into a logistic regression equation. The cut-offs used were: single match workloads (<30 or ≥30, <40 or ≥40 and <50 or ≥50 overs); previous 3 months workload (<150 or ≥150, <200 or ≥200 overs); previous season workloads (<300 or ≥300, <350 or ≥350, <400 or ≥400 and <450 or ≥450 overs) and career-to-date workloads (<1000 or ≥1000, <1200 or ≥1200, <1400 or ≥1400, <2000 or ≥2000 and <3000 or ≥3000 overs). Type of match (whether limited overs or first class) was included in analyses as a potential risk factor, as was injury status from an earlier match in the current season (whether the player had previously been injured that season or not). Age was not included as a potential risk factor because it was likely to correlate highly with career workload. A multivariate analysis was conducted using binary logistic regression in SPSS V.15.0.23 A forward stepwise method was used, with a p value of <0.05 required for a risk factor to be included at each step. The logistic regression output presented for each type of injury in the results was the best predictive model. For example, if both injuries in the next 21 and 28 days could be significantly predicted by a logistic regression model, the period which gave the best predictive model was utilised. Similarly, if both previous season workload of ≥350 and ≥400 overs were significant risk factors for injury, the cut-off which gave the strongest prediction was utilised. The data set included 235 fast bowlers over a 15-year time period who bowled in 14 600 player innings. They suffered 366 muscle injuries (most commonly hamstring, quadriceps, calf, adductor and side strains), 131 tendon injuries (most commonly rotator cuff, patellar, Achilles and groin tendon injuries), 120 bone stress injuries (most commonly lumbar, shin and foot stress fractures) and 78 joint injuries (most commonly knee, ankle and lumbar joint pathologies). Tables 1–⇓⇓4 detail multivariate workload risk factors for developing injuries in the various subsets. Tendon injuries had the highest number of significant workload-related risk factors. Very high acute match workload (≥50 overs) and high previous season workload (≥400 overs) were risk factors for developing tendon injuries, but high medium term workload (3-month workload ≥150 overs) was protective. Low (<1200 overs) and also very high (≥3000 overs) career workloads were protective for tendon injuries compared with medium or medium–high career workloads (1200–3000 overs). Playing in a limited overs match (ie, low acute match workload, ≤10 overs) and having had a previous injury (of any type) in the same season (which would have resulted in a period of zero match workload during the injury period) were also risk factors for tendon injury. Table 2 shows that while low career workload (<1200 overs) was protective against tendon injuries, it had the opposite effect for bone stress injuries (where it was a strong risk factor). High match workload in the previous 3 months (≥150 overs), and having had a previous injury in the same season were also risk factors for bone stress injury. Workload in the previous 3 months again had the opposite effect on risk for bone injuries than for tendon injuries (high workload in previous 3 months was a risk for stress fractures but protective against tendon injuries). Despite having the highest number of injuries of all of the tissue types, there were few significant risk factors predicting muscle injury in this model. Playing in a limited overs match was a risk factor, whereas having a high workload in the previous season was protective. The risk factors for joint injury were high career workloads (≥3000 match overs) and high workload in the previous season (≥450 overs). This study expands on a previous study from the same cohort19 showing that tissue susceptibility to injury varies according to preceding workload patterns. These variations are detailed in table 5 and figure 1. Since high workloads can increase or decrease injury susceptibility, the term ‘overuse’ injury is a misnomer, as both overuse and underuse are potentially relevant, particularly for tendon injuries. This has been previously described by other authors.2 Underuse may increase susceptibility to injury, perhaps due to subsequent upgrades in workload.18 For both tendon and bone stress injuries, a pattern of relatively high long-term workload appears advantageous, unless upper limits are exceeded. Risk factors for various types of injury. Tendon injuries appear to be particularly related to variations in workloads. For tendon injuries, previous injury in the same season (which would disrupt a workload pattern and create ‘underuse’) and >50 overs in a game are risk factors for injury. High previous season workload (>400 overs) is also a risk factor. However >150 overs in the previous 3 months is protective, which suggests tendon injuries are ‘overuse/underuse’ injuries and that workload relative to conditioning (recent previous workload) is most relevant for tendon injury. This fits the theory that ‘you need to load to withstand load’,24 with the caveat that there are upper limits that pose risk for all players. For bone stress injuries, career match workload of ≥1200 overs is highly protective, whereas bowling >150 overs in the previous 3 months increases risk. This highlights the dilemma for young players that they must bowl overs to condition their bones to be able to withstand the high workloads expected of a professional fast bowler, but doing this too quickly might place them at high risk of suffering a bone stress injury. 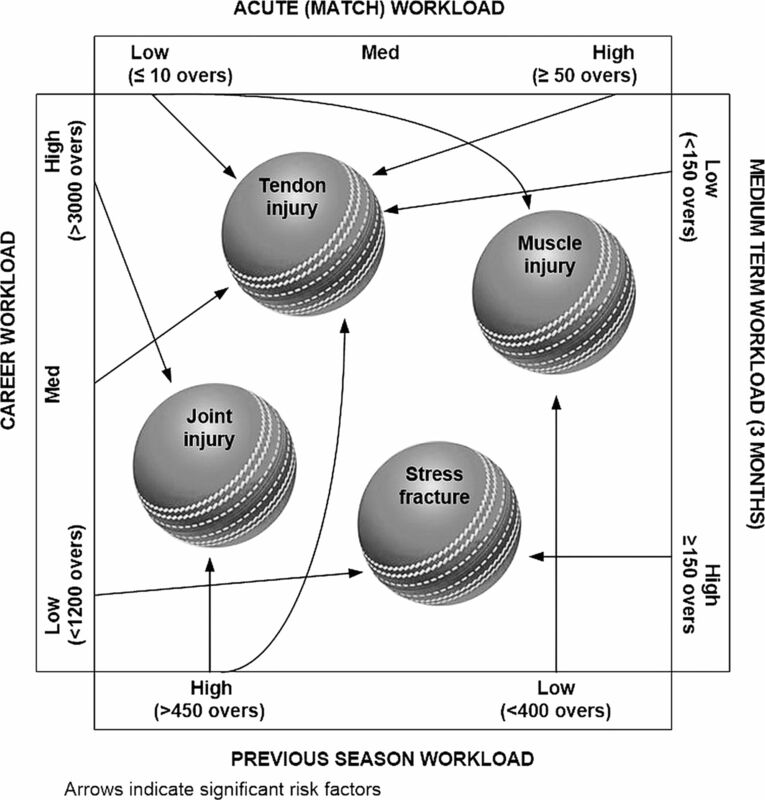 Joint injuries are more prevalent in players with high career workload (≥3000 overs) and previous season workload (≥450 overs). This indicates that high load over a longer period of time (season or career), rather than short bursts of high load (in a single match, week or month), predisposes joint injury. It should also be noted that perhaps older age is likely to be a concomitant factor as it is highly correlated to high career workload. It is clear that for a mature player (particularly with respect to tendon injuries), conditioning with moderate workloads protects against subsequent injury. However, setting ideal workloads for an inexperienced fast bowler trying to break into regular first class cricket is difficult in that loading is important to protect against injury, but the loading process itself is a risk factor for developing injuries, such as stress fractures (which then require long recovery times). It is clear from the findings of this study that workload has a complicated relationship with injury. It is neither true that “fast bowlers should bowl as much as possible to prevent injury” nor “fast bowlers bowl too much across the board and should all cut back on workload”. The general advice that is most accurate is that constant moderate workloads for fast bowlers probably protect best against injury, with a ‘moderate’ workload being 20–30 match overs per week, 150–200 match overs per 3 months and 400–450 match overs per season/year. The nature of scheduling matches means that it is obviously not always possible to keep match workloads within ‘ideal ranges’; however, these figures provide useful benchmarks that cricket coaches and support staff can use when planning player preparation and squad selection. One limitation of this study is that the diagnostic categories chosen (bone, tendon, muscle and joint injury) are not always clear-cut. For example, chronic groin pain is common in cricket and may be diagnosed as including elements of both a tendon (adductor tendinopathy) injury and a bone (osteitis pubis) injury. Similarly, some common tendon impingement conditions occur within joints and could, therefore, be considered to be from both joint and tendon injuries. To avoid a perception of data manipulation, the second character of the OSICS9 injury code was utilised to denote tissue type. However, it is recognised that not all experts would agree with all consequent categorisations made using this method. Another limitation is that it is quite possible (and even likely) that the different subgroups of injury within each category will have different risk factors (eg, hamstring strain compared with calf strain). As greater sample sizes become available in the future, it is likely that risk factors for common specific diagnoses will be identifiable. A further limitation is that the study was only able to analyse bowling workloads in major competitions involving Australian teams. Training workloads, overs bowled in competitions not involving Australian teams (eg, Indian Premier League or English County Cricket matches), and other risk factors, such as strength and joint range of movements, were not available. Player age was available, but was excluded due to it being strongly correlated with career workload, which was already included as a risk factor. Despite these limitations, the findings of this study (particularly with respect to tendon injuries) are in keeping with the beliefs of experts in rehabilitation and injury prevention (eg, that for tendon injuries, constant moderate loads are protective, with acute overload and prior relative ‘underload’ being risk factors). With respect to career workloads and risk of each injury type, the findings are analogous to the injury patterns seen in a clinical sports medicine practice; younger patients more often present with bone stress injuries, middle-aged patients more often present with tendon injuries and older patients present with joint-related pathology.27 In clinical medicine, bone stress injuries (including fatigue fractures of neck of femur and thoracic vertebrae) are also seen in the elderly population as well as the young (teenagers). This is believed to be the first study to provide cricket fast bowling workload thresholds likely to be related to tissue-specific injury risk. The dilemma of undertaking enough workload to offer relative protection against some types of injury (eg, tendon injury) without increasing risk of developing another (ie, bone stress fracture) is a precarious balancing act, especially for inexperienced fast bowlers. High acute workload, low recent workload, high previous season workload and moderate career workload are risk factors for tendon injuries in cricket fast bowlers. Low career workload and high recent workload are risk factors for stress fractures in cricket fast bowlers. Team support staff will, where possible, advise moderate rather than high or low workloads for cricket fast bowlers and perhaps, athletes in other sports. When a person is at high risk (eg, an inexperienced fast bowler with low recent workload because of previous injury), particular care is required to increase match workload gradually to avoid injury.
. The incidence and nature of epidemiological injuries to elite South African cricket players. SAMJ 2001;91:336–9.
. Disability days in major league baseball. Am J Sports Med 2001;29:436–6.
. SPSS for Windows. Base System User's Guide. Release 6.0 edn. Chicago: SPSS Inc., 1993.
. How big is a big odds ratio? Interpreting the magnitudes of odds ratios in epidemiological studies. Commun Stat Simul C 2010;39:860–4.
. Clinical Sports Medicine 4th edition. Sydney: McGraw-Hill, 2012. Contributors JWO is primary author and head of injury surveillance for CA and guarantor for the paper. JJO assisted with injury surveillance, and tables and figures for the paper. AK, PBl, JP, KS and PBr are/were all key providers of medical services for cricketers in this study and have all, therefore, provided data for injury surveillance; they have all extensively contributed to the development of ideas in this paper and writing of the manuscript. Competing interests All authors declare potential competing interests due to receiving direct or indirect payments from Cricket Australia (for either or both of injury surveillance or medical service provision). Is there ever a truth in evidence based medicine?